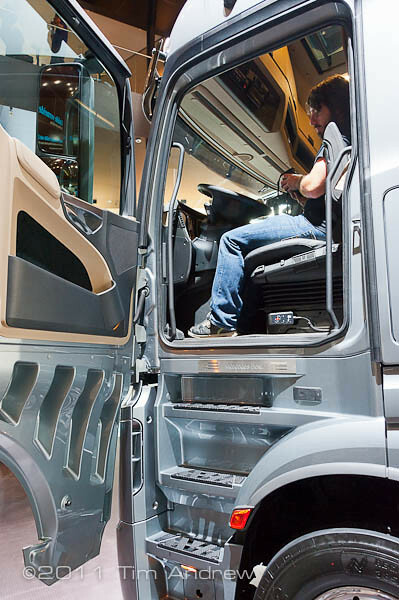 If you weren’t aware, the IAA Show is currently underway in Frankfurt, Germany. Now I knew it was on, but I honestly thought it was a mainly car based show, I didn’t know there was going to be trucks too. Anyway I needn’t have worried about missing out, as the blog is spreading through the ranks, my cousin, the well know name in automotive photography, Mr Tim Andrew, was out in Frankfurt. 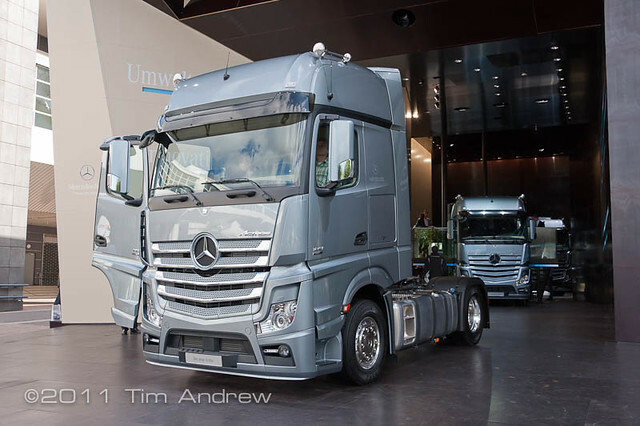 While on his way to photograph the new Lambo and Porsche, what did he stumble upon, yes that Marmite of new trucks, The new Mercedes Benz Actros. 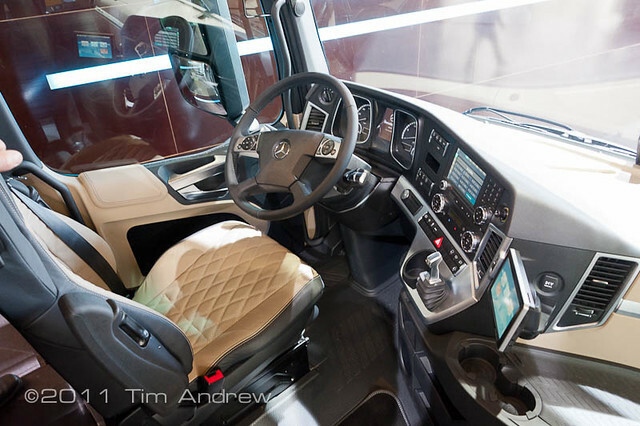 I think in my previous post about the new Actros I touched on its looks. Now we have had time to digest it, I still don’t think it is any clearer cut. As soon as I mention it anywhere, the instant response’s are, love it, hate it, love it, hate it, not necessarily it that order though!! In these photo’s i’m not that convinced that the silver/grey paint does it much justice, but the truck itself, the same as my opinion on Marmite….. I LOVE IT!! In fact why don’t we continue the whole Marmite theme, I can just picture said truck in black and yellow, it might just bring out the cab shape a bit more than the German grey/silver!! There were lots of promises and and talk of what the actual interiour was going to have, be made of and look like. If we assume that these photo’s are taken in a production model (most demo trucks eventually get sold to us lot), then I think it’s fair to say it looks pretty damn good. With my basic car knowledge, I think the rumour of using car components for the interiour of the new range, is true. The switch’s, knob’s and dial’s all look like the car one’s, in fact the whole interiour looks like the car. 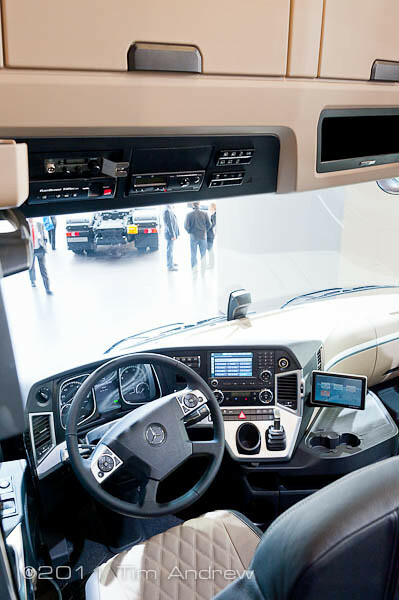 Before it wins the truck of the Year award, we here at Truckblog would like to award it the award for the most Amount of Switches and Buttons on a dash board. I imagine there will be a more down to earth fleet spec type interiour aswell. 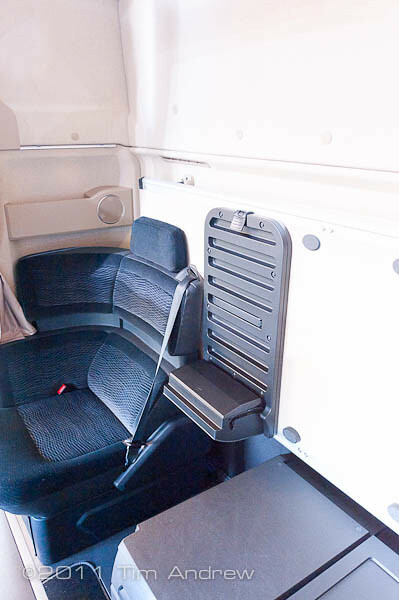 This cab below must have the largest Gigaspace cab, as it looks to have the single occupancy cab set-up. I’m still hoping that there will be some sort of UK launch, which I can get along too. In the mean time keep your eye’s peeled for the new truck on the road. If you see one in company colours, please send me a picture, ben@truckblog.co.uk as it will be good to see how it looks in standard company livery as opposed to shiny truck show get up. The final discussion point from these wonderfull photo’s came from GW, my boss. He has a problem with anything with more tahn 3 steps to heaven. I have to say that 5 steps up into the cab does, seem a little excessive. But my defence was, if your on long haul, you wont be getting in and out the cab all the time, GW responded with “Yes, but you still have to get in and out the cab 10 times, when you reach your delivery point”. 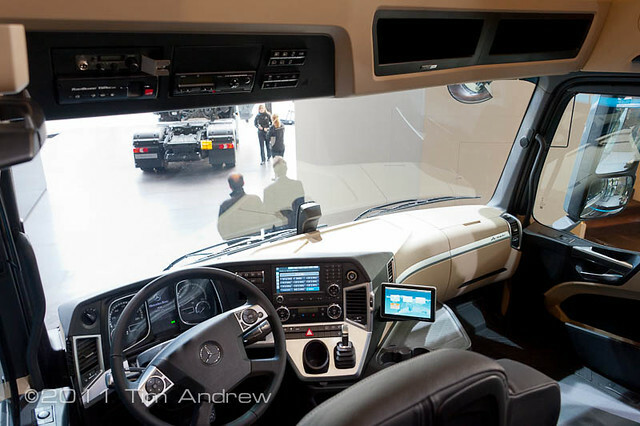 I’d be interested to hear your views, leave your comments below or send me an email; ben@truckblog.co.uk If you have a cab like this new Actros do you really care if you have to climb 5 steps? 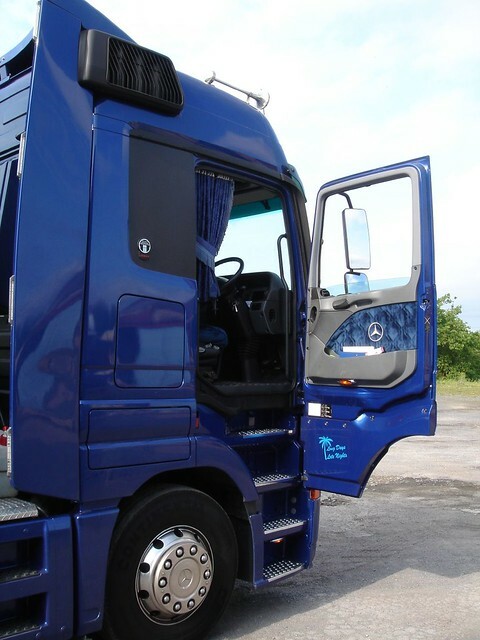 As you can see below, my old 2004 Actros, also had 5 steps to heaven, as the new one does. That just shows that I didn’t really notice the amount of steps. It wasn’t til I saw the photo again, that I realised the old had the 5 steps too. Case closed?? We’ll see what you have to say. 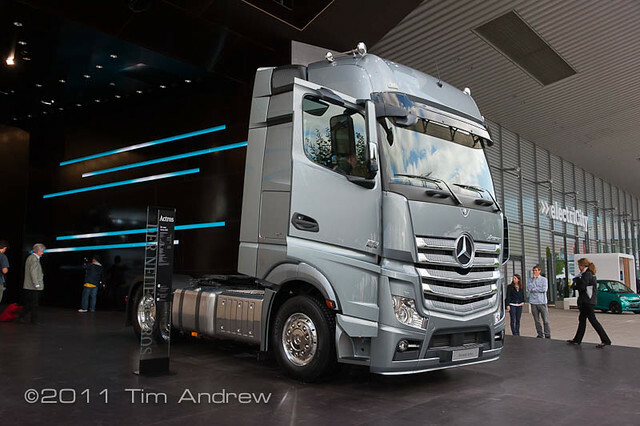 This entry was posted in Mercedes Benz, Photos, Show News by truckbloguk. Bookmark the permalink. as much as i am a big fan of hitlers revenge im not so sure i like the look of the front. it has a bit of a sad face if you understand what i mean.